According to an explosive academic study, the promise of SA has been betrayed by the ‘Zuma-centred power elite’, who have engaged in a ‘silent coup’. In the executive summary of Betrayal of the Promise: How South Africa is Being Stolen, multiple researchers from the State Capacity Research Project have found that South Africa has experienced a “silent coup”. In its executive report, the interdisciplinary, inter-university research partnership suggests that “South Africa has experienced a silent coup that has removed the ANC from its place as the primary force for transformation in society”. 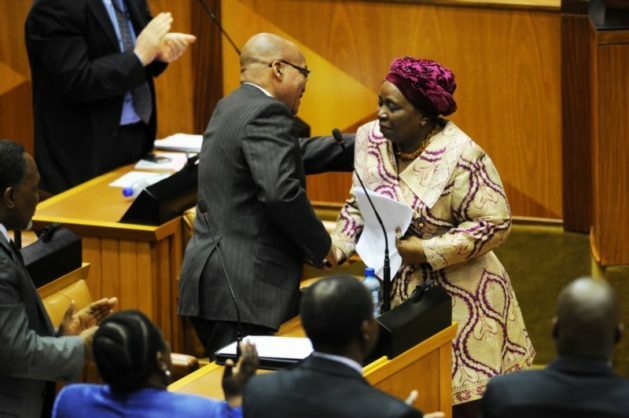 “Four public moments define this new era: the Marikana Massacre on 16 August 2012; the landing of the Gupta plane at Waterkloof Air Base in April 2013; the attempted bribing of former Deputy Minister of Finance Mcebisi Jonas to sell the National Treasury to the shadow state in late 2015; and the Cabinet reshuffle in March 2017. Resistance and capture is what South African politics is about today. “Commentators, opposition groups and ordinary South Africans underestimate Jacob Zuma, not simply because he is more brazen, wily and brutal than they expect, but because they reduce him to caricature. They conceive of Zuma and his allies as a criminal network that has captured the state. This approach, which is unfortunately dominant, obscures the existence of a political project at work to repurpose state institutions to suit a constellation of rent-seeking networks that have been constructed and now span the symbiotic relationship between the constitutional and shadow state. This is akin to a silent coup. “This report documents how the Zuma-centred power elite has built and consolidated this symbiotic relationship between the constitutional state and the shadow state in order to execute the silent coup. “At the nexus of this symbiosis are a handful of the same individuals and companies connected in one way or another to the Gupta-Zuma family network. The way that this is strategically coordinated constitutes the shadow state. “Well-placed individuals located in the most significant centres of state power (in government, SOEs and the bureaucracy) make decisions about what happens within the constitutional state. Those, like Jonas, Vytjie Mentor, Pravin Gordhan and Themba Maseko who resist this agenda in one way or another are systematically removed, redeployed to other lucrative positions to silence them, placed under tremendous pressure, or hounded out by trumped up internal and/or external charges and dubious intelligence reports. “This is a world where deniability is valued, culpability is distributed (though indispensability is not taken for granted) and where trust is maintained through mutually binding fear. Unsurprisingly, therefore, the shadow state is not only the space for extra-legal action facilitated by criminal networks, but also where key security and intelligence actions are coordinated. “It has been argued in this report that from about 2012 onwards the Zuma-centred power elite has sought to centralise the control of rents to eliminate lower-order, rent-seeking competitors. “The ultimate prize was control of the National Treasury to gain control of the Financial Intelligence Centre (which monitors illicit flows of finance), the Chief Procurement Office (which regulates procurement and activates legal action against corrupt practices), the Public Investment Corporation (the second-largest shareholder on the Johannesburg Securities Exchange), the boards of key development finance institutions, and the guarantee system (which is not only essential for making the nuclear deal work, but with a guarantee state entities can borrow from private lenders/banks without parliamentary oversight). The cabinet reshuffle in March 2017 has made possible this final control of the National Treasury.  The ballooning of the public service to create a compliant politically dependent, bureaucratic class.  The sacking of the ‘good cops’ from the police and intelligence services and their replacement with loyalists prepared to cover up illegal rent seeking (with some forced reversals, for example, Robert McBride).  Redirection of the procurement-spend of the SOEs to favour those prepared to deal with the Gupta-Zuma network of brokers (those who are not, do not get contracts, even if they have better BEE credentials and offer lower prices).  Subversion of Executive Authority that has resulted in the hollowing out of the Cabinet as South Africa’s pre-eminent decision-making body and in its place the establishment of a set of ‘kitchen cabinets’ of informally constituted elites who compete for favour with Zuma in an unstable crisis-prone complex network.  The consolidation of the Premier League as a network of party bosses, to ensure that the National Executive Committee of the ANC remains loyal. “At the epicentre of the political project mounted by the Zuma-centred power elite is a rhetorical commitment to radical economic transformation. Unsurprisingly, although the ANC’s official policy documents on radical economic transformation encompass a broad range of interventions that take the National Development Plan as a point of departure, the Zuma-centred power elite emphasises the role of the SOEs, particularly their procurement spend. Eskom and Transnet, in turn, are the primary vehicles for managing state capture, large-scale looting of state resources and the consolidation of a transnationally managed financial resource base, which in turn creates a continuous source of self-enrichment and funding for the power elite and their patronage network. “In short, instead of becoming a new economic policy consensus, radical economic transformation has been turned into an ideological football kicked around by factional political players within the ANC and the alliance in general who use the term to mean very different things. “The alternative is a new economic consensus. Since 1994 there has never been an economic policy framework that has enjoyed the full support of all stakeholders. “A new economic consensus would be a detailed programme of radical economic transformation achieved within the constitutional, legislative and governance framework. The focus must be a wide range of employment- and livelihood-creating investments rather than a few ‘big and shiny’ capital-intensive infrastructure projects that reinforce the mineral-energy-complex. The study participants said: “One of our aims is to change the popular discourse from a focus on corruption to a focus on the systemic nature of state capture as the political project of a well-organised network that strives to manage what we call the symbiotic relationship between the constitutional state and the shadow state. “To this end, this is not only a collaboration between University research institutions, we also aim to collaborate with various stakeholders, social movements and organisations engaged in similar work. This is why we have collaborated with the South African Council of Churches (SACC), who mounted their own independent process called the Unburdening Panel. The results of this work by the SACC were merged with some of our research and presented by the Secretary-General of the SACC at a public meeting at Regina Mundi, Soweto, on 18 May 2017. “Although the SACC’s Unburdening Panel and the State Capacity Research Project (SCRP) were totally independent processes using very different methodologies, the SACC concluded that the individual confidential testimonies they were receiving from Church members matched and confirmed the arguments developed by the SCRP using largely publicly available information. This triangulation of different bodies of evidence is of great significance. “The State Capacity Research Project is an academic research partnership between leading researchers from four Universities and their respective research teams: Prof. Haroon Bhorat from the Development Policy Research Unit, University of Cape Town; Prof. Ivor Chipkin from the Public Affairs Research Institute, University of the Witwatersrand; Prof. Mzukisi Qobo, part of the South African Research Chair Initiative – African Diplomacy and Foreign Policy, University of Johannesburg; Mr Lumkile Mondi, Department of Economics, University of the Witwatersrand; Professor Mark Swilling, Centre for Complex Systems in Transition, Stellenbosch University. 1. Produce this, our first report, by May 2017. 2. Release detailed case study reports of the state-owned enterprises that have been captured by the Zuma-centred power elite over the past decade. 3. Possibly by early 2018 produce a book manuscript and some journal articles.